Don’t Do Planning Poker for the Estimates (Only) | Leanify Ltd.
One of the techniques that Agile teams use for estimating their release or sprint backlog is Planning Poker. The game is very simple, but also a very nice instrument for provoking discussions and enhancing the quality of the planning meeting. For those of you who are not familiar with it, here is an explanation of some key concepts, along with a brief description of how to play. First, what are story points and t-shirt sizes? The first thing a team needs to do before they play is to choose the unit of measure they want to use for their estimates. Typically, teams estimate in story points or in T-shirt sizes. Both of these units represent the understanding about complexity and effort required to implement a user story or an epic. Many teams face difficulties to understand the concept initially, especially when using story points. It is indeed tricky – we are so used to planning in hours and days, that we easily start putting an equality sign between a story point and an hour, and this is, first of all, wrong and second, completely ruins the idea of the story point. When we plan in story points we are not interested in how much time we think it will take to get this story finished. We are rather focusing on what activities might be required to complete it and how complex they are from the perspective of our current knowledge as a team. Then we put some estimate to the story, which is relative to a baseline story that we have defined previously. The same story might be estimated differently by two different teams, as they have different experience and skill set. For example, if our team has to paint our living room, we could estimate the effort and complexity of painting a wall without windows to be 1 story point. Painting a wall with the same size but with a window in the middle might be estimated to 0.5 story points if we have special tools to protect the window and some experience with painting such walls. But another team without the tools and experience might estimate the same work to 2 story points as it is more complex from their perspective. In case that your team is new to Agile and the concept of estimating in story points, it might be easier to estimate in T-shirt sizes, which represents the size of the work to be done, and is not so easy to confuse with hours. It is very important for the team to understand well what activities the baseline story contains. The best approach is to take a small story that you implemented before or one that you understand very well in terms of requirements and make sure that everybody on the team has the same understanding. Finally, decide how much story points or which t-shirt size you will allocate to this story – it will later serve you as a guidance to estimate the others. Second, how do we play? All you need is a deck of planning poker cards. The ProductOwner introduces the story that you will be estimating. Then you decide how many story points you will allocate and pick the relevant card from the deck. When the meeting facilitator gives a sign, all team members show their cards simultaneously. The people who allocated the most and the least points explain their reasons and a round of additional questions and clarifications follows. Then you do another round of estimations, and you repeat the procedure until the estimates are very close or equal. The main benefit from this is not really the precise estimate that you will get. It is just a consequence of a thorough discussion and good understanding that the team co-create as they ask questions and share views. It is the clarity of what is required that would bring the team to a successful execution, and better predictability of the result. 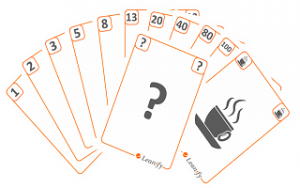 So, if you decide to try planning poker, or you are already using it, remember – do not do it for the estimates only – in the first place, do it for the discussions and the knowledge sharing. Update: Our iOS application is already available. You can download it here.